"Fr. Iakovos put a canon on me," she responded. She also told him the reason. He said: "No, grandmother, don't worry. He's an illiterate monk. I'm educated and I'll undo the canon. Come Sunday so I can give you communion." But as the grandmother approached to receive, she felt the holy spoon to be empty and cold, and did not understand the taste of the Holy Communion. This wondrous event repeated for two more Sundays, so the woman worried and went again to Elder Iakovos. "My child," he told her, "a canon cannot be undone. You must fulfill the canon I put on you." In 1987 Fr. Iakovos confessed a girl, but he forbade her to commune. She then went to a certain Bishop, who allowed her Divine Communion. But when she approached to commune, the holy spoon entered her mouth empty. This strange wonder repeated another time, so the girl became terrified, and having repented she went to confess again to Fr. Iakovos. 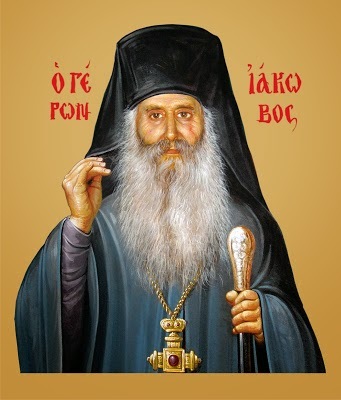 "When I commune people," Elder Iakovos would say, "I never look at their face. Sometimes however my thoughts tell me to look at them. Then I see some faces having the form of a dog, a monkey or another animal. Their form is frightening. But I also see some who are glad and cheerful who after Divine Communion shine like the sun." One time a certain concelebrant of his told him: "The Divine Communion burned me!" "But I," answered the Elder, "didn't feel any burning." Rather, he would experience the partaking of Divine Communion so strongly, that he would become renewed in soul and body. "Today that you have communed," he said to one of his spiritual children, "do you see how you feel? This is how I always feel. Christ is always in me." Source: From the book ΘΑΥΜΑΤΑ ΚΑΙ ΑΠΟΚΑΛΥΨΕΙΣ ΑΠΟ ΤΗ ΘΕΙΑ ΛΕΙΤΟΥΡΓΙΑ (Miracles and Revelations From the Divine Liturgy). Translation by John Sanidopoulos.